Marble or Wood Window Sills: Which is Right for Your Project? Wood window sills are commonly used in all types of construction projects, but they aren’t the only choice. Educational centers and health care facilities have made the switch from wood to plastic because they’re easier to clean and care for, but they aren’t nearly as durable. Another option is to install marble in lieu of wood and give the entire project an upscale feel. If you’ve been debating between wood and marble, here are some factors to consider so that you can choose the right one for your project. One of the greatest features of marble is that it requires very little maintenance over the years. Simply sealing the stone will help keep stains away, and cleaning is as easy as wiping it down with a damp cloth. It looks great for decades without requiring any scraping, sanding or painting. When you’re working on a project that you’ll eventually walk away from, you may be tempted to focus more on the initial cost than the cost of maintenance, but you should remember that your future buyers will have a very different view. When they see marble window sills, they see a luxurious material that’s easier to care for, and that will give you an important edge over other contractors. Nobody likes dealing with germs, and hospitals and schools are two places where they seem to spread the fastest. A little-known fact about marble is that it’s naturally resistant to germs, allergens and bacteria. Wood is a natural breeding ground for microscopic pathogens, but they don’t linger and expand on stone the way they do on other surfaces. This makes it easier for hospitals and schools to maintain a clean and healthy environment. If you’re working on this type of center, you may want to focus on marble thresholds, floors, and window sills as a key selling point. The sun is hard on all types of materials, and it can be devastating for wood. Over time, wood materials start to fade and dry out. They must be painted regularly to protect the surface. Even with regular painting, you can still wind up with cracks and dry areas that are simply unattractive, and the damage is accelerated as the intensity of the sun increases. When working on projects in southern climates, consider going with marble for greater durability. Unlike wood structures that fall apart over time, the marble statues and buildings of ancient Rome continue to grace the landscape as a testament to the durability of this building material. And while some facilities, like hospitals and schools, have made the switch to plastic sills because of their resistance to germs, this material is particularly susceptible to UV damage. These sills wind up warping, splitting, or yellowing after just a few short years. They can also cost as much as marble. In applications where wood may not work due to regular or intense sun exposure, marble is always the better choice. Moisture can seep into porous wood and lead to rot, and you may not realize there’s a problem until you start seeing peeling paint and feeling weak areas. This isn’t a concern with hard, durable, natural stones like marble. Used extensively in interior and exterior applications, marble can withstand regular exposure to water. This is why it’s a top choice for shower walls and bathroom floors. This is the same reason it’s a popular choice for window sills. Consider using marble for all of your exterior sills to give the property an upscale look that wood cannot mimic. Use marble in high-humidity rooms like the kitchen and bathroom to avoid a full range of problems, including mold, peeling paint, and general degradation. When you’re working on luxury properties for discerning owners, you need to skip the low-end materials and provide them with luxurious materials that will meet their expectations. Meticulously painted wood will never look as nice as marble, and wood cannot mimic the visual movement created by the natural veining in fine marble. Your high-end homes will be fitted with granite countertops and marble floors, and you can show great attention to detail by carrying that material through to the door thresholds and window sills. When you take the time to install a custom window with a curved or other unique shape, you want to give it the attention that it deserves. Wood window sills can be an eyesore on luxurious custom windows that are wider in size, feature deeper sills or have other special features. 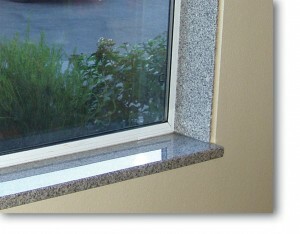 However, you can put the perfect finishing touches on these windows with beautiful marble sills. They’ll accent the space and ensure that your windows look as amazing as they are. This is also an easy way to upgrade and visually improve basic windows that might feel a little bland with simple wood sills. At the end of it, there simply is no wrong place for marble window sills and thresholds. They’re used in commercial buildings because they’re more durable and easy to care for. They’re the best choice for people who are trying to keep germs away for the safety of their clients, students and family members. Attractive and resistant to stains, they’re the perfect addition to any home. Available in tan, white, beige, and even gray, they can be matched to any décor from traditional to contemporary. They’re the best choice for areas that will get wet or have regular exposure to the sun because marble is not harmed by these elements. Whether you’re searching for the right finishing touch for a grand window or want to dress up a basic stock window, marble is the right choice. Our sills are meticulously crafted for appearance and durability. We work diligently to maintain excellent cost control throughout the quarrying and supply process, and we pass those savings on to our customers. We also work with national shippers so that you won’t have to wait long to have your orders filled. With our team by your side, you won’t have to choose between wood and marble window sills. You’ll be able to use marble throughout your construction projects to ensure that every window you install looks great and that you make a fantastic impression on potential customers. Most importantly, you don’t have to worry about the initial cost of marble when you know where to purchase your supplies. Stonexchange offers competitive wholesale pricing on high-quality marble window sills. Contact us today with your questions or to get a quote!